Singapore, 15 March 2016 – The prevailing Northeast Monsoon conditions are expected to gradually weaken over the next fortnight. The low level winds are forecast to blow predominantly from the northeast or northwest, and become light and variable in direction as the Northeast Monsoon transitions to inter-monsoon conditions in the later part of the month. 2. The next fortnight is expected to be drier and warmer than that experienced in the first fortnight of March 2016. During this period, the daily maximum temperatures are expected to range between 33°C and 34°C, and could reach a high of around 36°C on a few days. The mean monthly temperature for March 2016 is likely to be comparable to that for the warmest March on record (29.5°C in 1998). 3. The warmer conditions are due to the continuing influence of the El Nino and the presence of a dry and warm air mass over the region. The occurrence of the equinox is another contributing factor to the warm temperatures during this time of the year. 4. Despite the drier conditions, short-duration thundery showers in the afternoon on 4 to 6 days can still be expected over parts of Singapore, due to strong solar heating of land areas and convergence of winds in the surrounding vicinity. The rainfall for March 2016 is expected to be significantly below-normal. 5. During the review period, Northeast Monsoon conditions prevailed in the region with the low level winds over Singapore blowing predominantly from the northeast. 6. In the first week of March 2016, Singapore experienced occasionally windy conditions with short-duration thundery showers in the afternoon on some days. Dry and warm conditions were experienced in the second week of the month where the daily maximum temperature recorded was between 34.5°C and 35.0°C. 7. 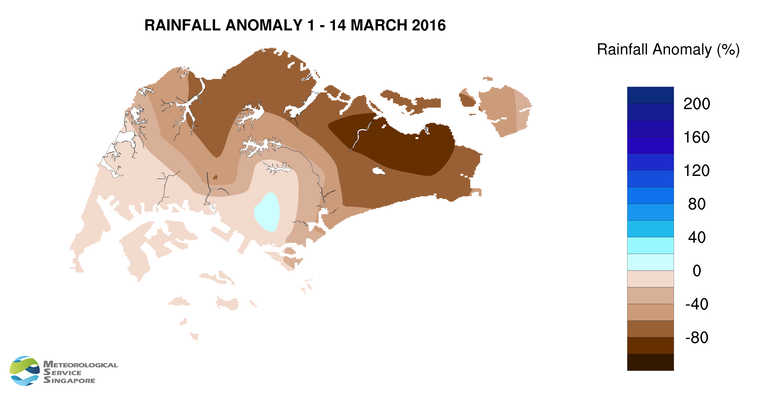 Almost all areas of Singapore received below average rainfall in the first half of March 2016. Rainfall was lowest over the eastern part of the island around Pasir Ris, where 4mm (95% below average) was recorded. The highest rainfall of 119mm (15% above average) was recorded over the southwest-central part of Singapore around Queenstown. An equinox occurs twice a year around 20 March and 22 September. During an equinox, with the sun directly overhead around noon, sunlight reaching the earth’s surface is most intense and contributes to higher daytime temperatures.